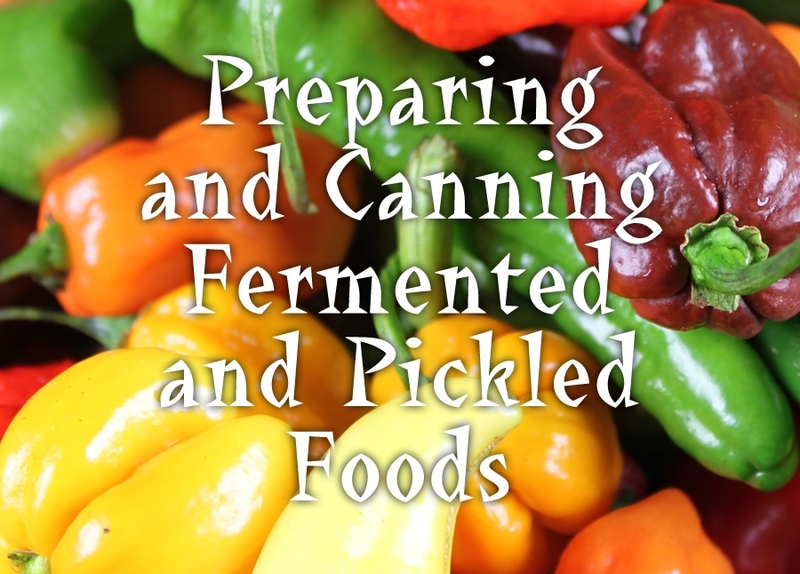 The many varieties of pickled and fermented foods are classified by ingredients and method of preparation. Regular dill pickles and sauerkraut are fermented and cured for about 3 weeks. Refrigerator dills are fermented for about 1 week. During curing, colors and flavors change and acidity increases. Fresh-pack or quick-process pickles are not fermented; some are brined several hours or overnight, then drained and covered withvinegar and seasonings. Fruit pickles usually are prepared by heating fruit in a seasoned syrup acidified with either lemon juice or vinegar. Relishes are made from chopped fruits and vegetables that are cooked with seasonings and vinegar. Be sure to remove and discard a 1/16-inch slice from the blossom end of fresh cucumbers. Blossoms may contain an enzyme which causes excessive softening of pickles. Caution: The level of acidity in a pickled product is as important to its safety as it is to taste and texture. Do not alter vinegar, food, or water proportions in a recipe or use a vinegar with unknown acidity. Use only recipes with tested proportions of ingredients. There must be a minimum, uniform level of acid throughout the mixed product to prevent the growth of botulinum bacteria. Select fresh, firm fruits or vegetables free of spoilage. Measure or weigh amounts carefully, because the proportion of fresh food to other ingredients will affect flavor and, in many instances, safety. Use canning or pickling salt. Noncaking material added to other salts may make the brine cloudy. Since flake salt varies in density, it is not recommended for making pickled and fermented foods. White granulated and brown sugars are most often used. Corn syrup and honey, unless called for in reliable recipes, may produce undesirable flavors. White distilled and cider vinegars of 5 percent acidity (50 grain) are recommended. White vinegar is usually preferred when light color is desirable, as is the case with fruits and cauliflower. Alum may be safely used to firm fermented pickles. However, it is unnecessary and is not included in the recipes in this publication. Alum does not improve the firmness of quick-process pickles. The calcium in lime definitely improves pickle firmness. Food-grade lime may be used as a lime-water solution for soaking fresh cucumbers 12 to 24 hours before pickling them. Excess lime absorbed by the cucumbers must be removed to make safe pickles. To remove excess lime, drain the lime-water solution, rinse, and then resoak the cucumbers in fresh water for 1 hour. Repeat the rinsing and soaking steps two more times. To further improve pickle firmness, you may process cucumber pickles for 30 minutes in water at 180°F. This process also prevents spoilage, but the water temperature should not fall below 180°F. Use a candy or jelly thermometer to check the water temperature. Pickle products are subject to spoilage from microorganisms, particularly yeasts and molds, as well as enzymes that may affect flavor, color, and texture. Processing the pickles in a boiling-water canner will prevent both of these problems. Standard canning jars and self-sealing lids are recommended. Processing times and procedures will vary according to food acidity and the size of food pieces. This document was adapted from the “Complete Guide to Home Canning,” Agriculture Information Bulletin No. 539, USDA, revised 1994.